Allowing your family members to participate in the family’s financial decisions and money-management responsibilities is beneficial. The more informed everyone is, the more you can work together to achieve your shared financial goals. So many people never learned about money at school, and most parents never talked about finances to their children. Where are your children going to learn to make informed decisions about money if you don’t teach them? What happens to the spouse or partner who was never interested or involved in the family finances if something happens to you? Are you really doing them any favors by taking on this responsibility single-handedly? You must make managing money a shared responsibility within your family. No one learns this stuff in school; it’s an on-the-job learning experience. Allow your family some on-the-job experience while you’re around for guidance. The example worksheet here explores some ways that one individual shares money-management responsibilities with his family members — for his benefit and theirs. Sharing financial responsibilities starts with outlining an agreement. 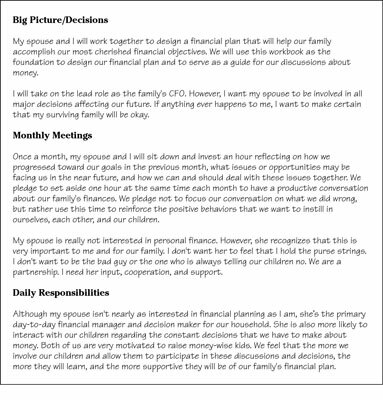 Download the Sharing Responsibilities form and write down, in your own words, your desires and thoughts about involving your family in the big-picture financial goals and decisions, as well as your periodic and daily responsibilities. 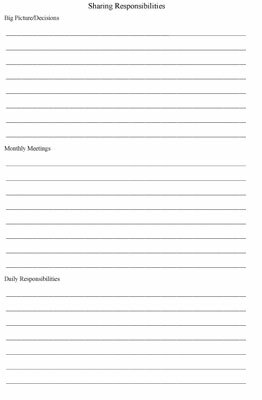 Click here to download and print the Sharing Responsibilities form.